When you refurbish your kitchen, it is just understandable that your main concerns include the layout, flooring, and appliances. Indeed, these major kitchen elements need to be well-thought-out. However, without the finishing touches, your kitchen may look like just any other kitchen. If you wish to put your personal taste to it, then you would need some kitchen accessories. There is a wide range of accessories to choose from, and when choosing them, consider not only their aesthetic value but also their practicality. Below are some examples of such accessories. You should consider getting canisters sets because they are useful and add style to your kitchen at the same time. In terms of function, they allow for additional storage space. In terms of aesthetic value, they usually come in sets and in different colors and designs. They are also available in various materials, such as ceramic and stainless steel. As such, they also serve as decorative pieces. Another great addition to your accessories is a three-piece table set. This set typically includes salt and pepper shakers and a napkin holder. Match the theme of this table set with the canister set, and you will have enhanced the look of your kitchen. Now if you have a small kitchen, it is important that you make use of accessories that help maximize its space. For instance, choose a pull-out table as it creates temporary work space for food preparation, and it can serve as an additional serving area. You can just place it on the top of a base where you typically see a drawer, just below the worktop. Or, make use of a stemware rack, which you can put under kitchen cabinets. While it makes for a good decorative item, it also allows you to store glasses safely and conveniently. To maximize space, you can also place additional racks on the upper part of the door or above the cabinets. Your kitchen should be designed in a way that makes it easy for you to carry out food preparation and cooking tasks. As such, its layout, the appliances you pick, and the flooring are very important. However, it is also important to have it look and feel a certain way, especially one that is based on your preference, and it can be achieved by making use of kitchen accessories. Get them not just for their decorative value but also for their function, though.  Without the finishing touches, your kitchen may look like just any other kitchen. 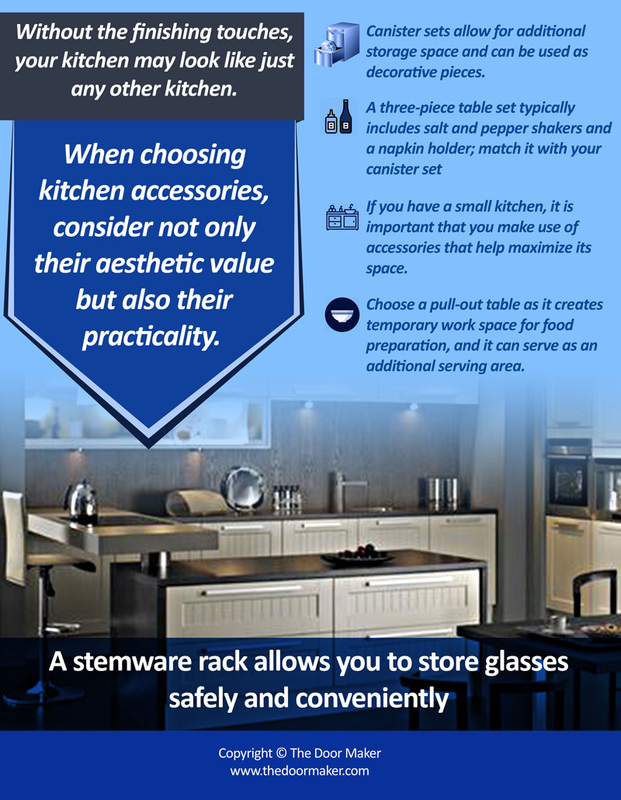  When choosing kitchen accessories, consider not only their aesthetic value but also their practicality.  Canister sets allow for additional storage space and can be used as decorative pieces.  If you have a small kitchen, it is important that you make use of accessories that help maximize its space.  Choose a pull-out table as it creates temporary work space for food preparation, and it can serve as an additional serving area.